Pretty much, the one thing that everyone agrees on, when it comes to healthy eating, is that we should eat more vegetables. 5 serves a day even. Last month I decided to have an experiment. I called it ‘The Month of Extreme Veg’ and my goal was to eat 6 serves of vegetables a day for the whole month. On average I made it. Some days were less and some days were more. I even had a personal best of 8 serves one day. Safe to say, I had a lot of practice preparing vegetables and I noticed something really interesting. When I was short on time, I’d just chop up the vegetables and toss them in a salad dressing or sometimes just a little olive oil and a squeeze of lemon. So that’s how you save time. Just skip the cooking part. We’re conditioned to think of vegetables as mostly cooked. And lets face it, cooking takes time. It also destroys heat sensitive nutrients and enzymes. So there are even more benefits than just saving time. Mostly, the finer you slice or the smaller you chop, the easier they’ll be to eat. 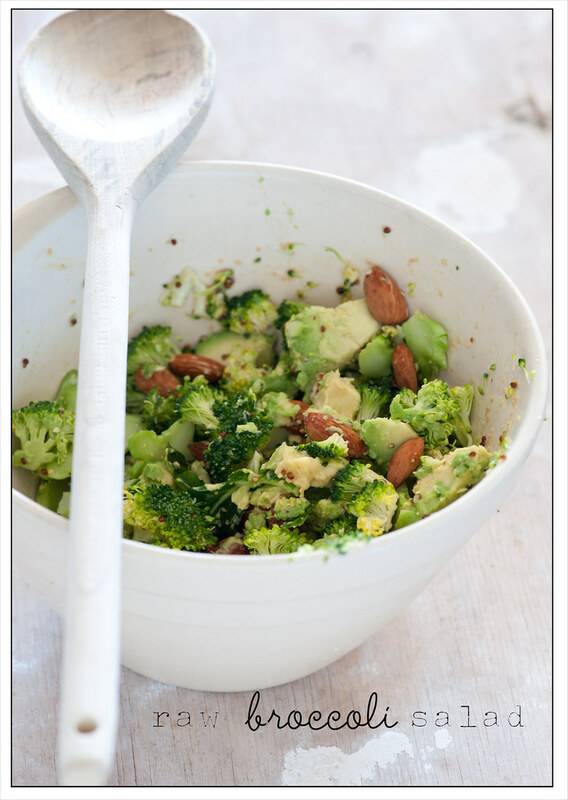 I just adore the way the avocado and broccoli combine in this salad to give crunch and creamy richness. I think I’ve discovered a new food marriage made in heaven. Feel free to take this idea wherever your imagination takes you. While I find it fairly substantial for lunch with the nuts and avocado, I’d add in a few more almonds or serve with some shredded poached chicken or some proscuitto for a larger meal. Canned tuna or salmon would also be lovely. Those with nut allergies could easily just skip the almonds or replace them with a little finely diced red onion for the colour and crunch. 1. Combine mustard, vinegar and 3 tablespoons extra virgin olive oil in a salad bowl. Season. 3. Chop broccoli into tiny trees and toss in the dressing. 4. Chop avocado in half and scoop bight sized chunks into the dressing using a spoon. 5. Toss salad to distribute the dressing and serve with almonds on top. I grew up (and still do) eating a lot of vegetables raw. Potato and carrot in particular were always served in bowl of cold water on the table. Cauliflower and broccoli were always eaten raw as well. The only time that I have solid memories of any of these vegetables been cooked was at Christmas when we would have mash potato, glazed carrots and au gratin made with cauliflower and broccoli. I asked my mother a couple of years ago why this was and it was simply that as a child she didn’t like the texture of cooked veggies so her mother served them to her raw. I like the look that salad so much I think I know what I’m having for lunch tomorrow! And thanks for letting us know that raw spuds are safe to eat! I had it for lunch today. Enjoy! Is sherry vinegar the same as wine vinegar? This salad looks divine! My friend and I plan these random raw dinner parties to work on getting some raw veggies in our diet more often, and this will definitely be making an appearance! I wanted to make this to accompany the arabic kofte I wanted to grill on the BBQ tonight, but I couldn’t find any advocado anywhere. Luckily the chickpea saled I made was also very good! I’ll be making this for dinner tonight – even if it is Winter in Brisbane – and freezing cold at 23′!!!!! Looks delicious! Sometimes I just buy a veggies tray and graze on it for a couple of days. It’s chopped and clean and super simple! Sherry vinegar is similar to wine vinegar – about half way between white and red wine vinegar. You could substitute in either or try lemon juice. I could always stand to eat more vegetables very often I end up cooking them. Enjoying avocados now which are currently in season here. I actually have eaten eggplant/aubergine raw. In my opinion, it’s a neat taste, kind of apple-like. But I don’t think I’d attempt a raw artichoke. Love the look of your salad. My dh and I are doing a raw vegan month and so we will definitely make this for lunch on the weekend. I made this two days in a row for my lunch last week, and something in it was wreaking havoc with my tummy, It was excessively rumbly and painful both days, making me unable to sleep. Would it be the raw broccoli? Or maybe because I was eating quite a large volume of raw broccoli? Or would it be the sherry vinegar? Any thoughts? I really want to keep eating this it’s so yum-o! Jules this is incredible! I’m yet to make one of your recipes that I don’t enjoy (your warm chickpea salad with rosemary and garlic has been a particular fave) and this broccoli salad is no exception. I wasn’t sure how it’d go, but it is utterly delicious, and has become a regular lunchtime meal. Even my super-fussy partner loves it. Thanks Jules, so easy, so healthy, and so freaken delicious! Made this salad over the weekend and it is spectacular. One of our new favorites we will make often. Thanks for your creative inspiration. Wow! Thanks for this great idea! A surprising marriage but so divine! I like to add a small crushed garlic clove and a smidgen of chili flakes! A firm favorite in our house! This has beconme my go-to “need green” salad. Come on, all this green just screams “healthy”. PLus it’s so easy to make. I often add a bit of plain salad to make it even greener. Since I discovered this recipe a few months ago, I always have some broccoli and avocado ready somewhere. Thank you ! I just had this for lunch today and had to come on here to rave about it!! I’m new to the idea of raw broccoli, so I warmed it a little in the microwave first (just a little so it was still crunchy!) added the almonds and avocado and go! I had it with a garlic-parmesan dressing and it was AMAZING! Thanks so much for the great lunch ideas – I’d been struggling to get my vegge fill! Glad you liked it Kitty! I will try this combo immediately! It reminded me of one of my most favorite avocado combinations: shredded cabbage + shredded carrots mashed together with avocado and some lemon juice — as a plain salad or even on toast. Thank you for sharing such delicious recipes. These recipes all sound great and are perfect my lunch needs … is there anywhere to find nutrition information? The avocados dontturn brownie you leave them in the fridge overnight? This was so delicious! I blanched the broccoli because raw broccoli makes my stomach cramp, and I replaced the almonds with pumpkin seeds. Lovely and hefty – perfect for when I just want to eat and eat.